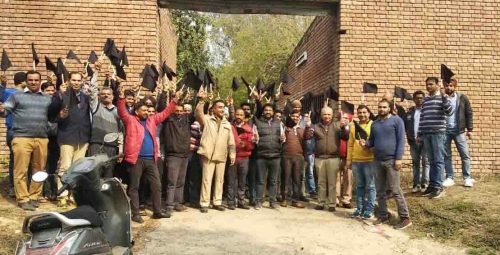 Chandigarh 6th February; The Non Faculty Staff of PGI under banner of PGI Employees Union M, PGI Medical Technologists Association and PGI Engineering Staff Association held a Mock Drill with black flags today. Non Faculty Staff gathered during lunchtime and encircled Community Centre, Central Workshop and 40 houses with black flags in their hands, which have been planned for demolition to construct new Centres. Unfortunately, no steps have been taken to plan / construct new Community Centre, Central Workshop and 40 houses in the last 2-3 years. Only 15-20% out of 7000 regular non faculty staff have been provided houses and they are forced to live in far flung areas for cheaper accommodation, which affects their attending round the clock patient care services. Union got funds from MPLAD Scheme for construction of Community Centre since 1996-97 , which is planned for renovation and entire plan is in pipeline but Dr Jagat Ram, DPGI has now ordered its demolition under a mysterious plan, which is quite unfortunate. Further, about 100 houses of Type 3 & 4 sanctioned in 2014-15 have not been constructed, and no approval has been granted for construction of 4 houses in place of 40 houses planned for demolition. Moreover, a geriatric centre adjoining Religious Places which regularly hold functions using Loudspeakers is an ill planned move. The Non Faculty Staff will appeal to Sh. Jagat Prakash Nadda, Union Health Minister on 9.2.2019 to review and reconsider the anti employees decision of demolishing above building and houses.